Lenses can be used to focus light. A lens is an optical device with perfect or approximate axial symmetry which transmits and refracts light, converging or diverging the beam. A simple lens consists of a single optical element. A compound lens is an array of simple lenses (elements) with a common axis; the use of multiple elements allows more optical aberrations to be corrected than is possible with a single element. Lenses are typically made of glass or transparent plastic. Elements which refract electromagnetic radiation outside the visual spectrum are also called lenses: for instance, a microwave lens can be made from paraffin wax. The variant spelling lense is sometimes seen. While it is listed as an alternative spelling in some dictionaries, most mainstream dictionaries do not list it as acceptable. Image of a plant as seen through a biconvex lens. The oldest lens artifact is the Nimrud lens, which is over three thousand years old, dating back to ancient Assyria. David Brewster proposed that it may have been used as a magnifying glass, or as a burning-glass to start fires by concentrating sunlight. Assyrian craftsmen made intricate engravings, and could have used such a lens in their work. Another early reference to magnification dates back to ancient Egyptian hieroglyphs in the 8th century BC, which depict "simple glass meniscal lenses". The earliest written records of lenses date to Ancient Greece, with Aristophanes' play The Clouds (424 BC) mentioning a burning-glass (a biconvex lens used to focus the sun's rays to produce fire). The writings of Pliny the Elder (23–79) also show that burning-glasses were known to the Roman Empire, and mentions what is arguably the earliest use of a corrective lens: Nero was said to watch the gladiatorial games using an emerald (presumably concave to correct for myopia, though the reference is vague). Both Pliny and Seneca the Younger (3 BC–65) described the magnifying effect of a glass globe filled with water. The word lens comes from the Latin name of the lentil, because a double-convex lens is lentil-shaped. The genus of the lentil plant is Lens, and the most commonly eaten species is Lens culinaris. The lentil plant also gives its name to a geometric figure. The Arab physicist and mathematician Ibn Sahl (c.940–c.1000) used what is now known as Snell's law to calculate the shape of lenses. Excavations at the Viking harbour town of Fröjel, Gotland, Sweden discovered in 1999 the rock crystal Visby lenses, produced by turning on pole-lathes at Fröjel in the 11th to 12th century, with an imaging quality comparable to that of 1950s aspheric lenses. The Viking lenses concentrate sunlight enough to ignite fires. Widespread use of lenses did not occur until the use of reading stones in the 11th century and the invention of spectacles, probably in Italy in the 1280s. Scholars have noted that spectacles were invented not long after the translation of Ibn al-Haytham's Book of Optics into Latin, but it is not clear what role, if any, the optical theory of the time played in the discovery. Nicholas of Cusa is believed to have been the first to discover the benefits of concave lenses for the treatment of myopia in 1451. The Abbe sine condition, due to Ernst Abbe (1860s), is a condition that must be fulfilled by a lens or other optical system in order for it to produce sharp images of off-axis as well as on-axis objects. It revolutionized the design of optical instruments such as microscopes, and helped to establish the Carl Zeiss company as a leading supplier of optical instruments. Most lenses are spherical lenses: their two surfaces are parts of the surfaces of spheres, with the lens axis ideally perpendicular to both surfaces. Each surface can be convex (bulging outwards from the lens), concave (depressed into the lens), or planar (flat). The line joining the centres of the spheres making up the lens surfaces is called the axis of the lens. Typically the lens axis passes through the physical centre of the lens, because of the way they are manufactured. Lenses may be cut or ground after manufacturing to give them a different shape or size. The lens axis may then not pass through the physical centre of the lens. Toric or sphero-cylindrical lenses have surfaces with two different radii of curvature in two orthogonal planes. They have a different focal power in different meridians. This is a form of deliberate astigmatism. More complex are aspheric lenses. These are lenses where one or both surfaces have a shape that is neither spherical nor cylindrical. Such lenses can produce images with much less aberration than standard simple lenses. If the lens is biconvex or plano-convex, a collimated or parallel beam of light travelling parallel to the lens axis and passing through the lens will be converged (or focused) to a spot on the axis, at a certain distance behind the lens (known as the focal length). In this case, the lens is called a positive or converging lens. 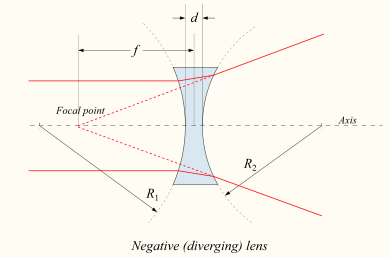 If the lens is biconcave or plano-concave, a collimated beam of light passing through the lens is diverged (spread); the lens is thus called a negative or diverging lens. The beam after passing through the lens appears to be emanating from a particular point on the axis in front of the lens; the distance from this point to the lens is also known as the focal length, although it is negative with respect to the focal length of a converging lens. Convex-concave (meniscus) lenses can be either positive or negative, depending on the relative curvatures of the two surfaces. A negative meniscus lens has a steeper concave surface and will be thinner at the centre than at the periphery. Conversely, a positive meniscus lens has a steeper convex surface and will be thicker at the centre than at the periphery. An ideal thin lens with two surfaces of equal curvature would have zero optical power, meaning that it would neither converge nor diverge light. All real lenses have a nonzero thickness, however, which affects the optical power. To obtain exactly zero optical power, a meniscus lens must have slightly unequal curvatures to account for the effect of the lens' thickness. d is the thickness of the lens (the distance along the lens axis between the two surface vertices). The signs of the lens' radii of curvature indicate whether the corresponding surfaces are convex or concave. The sign convention used to represent this varies, but in this article if R1 is positive the first surface is convex, and if R1 is negative the surface is concave. The signs are reversed for the back surface of the lens: if R2 is positive the surface is concave, and if R2 is negative the surface is convex. If either radius is infinite, the corresponding surface is flat. With this convention the signs are determined by the shapes of the lens surfaces, and are independent of the direction in which light travels through the lens. Lenses have the same focal length when light travels from the back to the front as when light goes from the front to the back, although other properties of the lens, such as the aberrations are not necessarily the same in both directions. 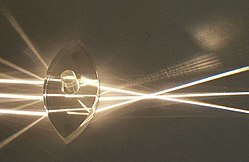 This image has three visible reflections and one visible projection of the same lamp; two reflections are on a biconvex lens. where x1 = S1 − f and x2 = S2 − f.
What this means is that, if an object is placed at a distance S1 along the axis in front of a positive lens of focal length f, a screen placed at a distance S2 behind the lens will have a sharp image of the object projected onto it, as long as S1 > f (if the lens-to-screen distance S2 is varied slightly, the image will become less sharp). This is the principle behind photography and the human eye. The image in this case is known as a real image. Note that if S1 < f, S2 becomes negative, the image is apparently positioned on the same side of the lens as the object. Although this kind of image, known as a virtual image, cannot be projected on a screen, an observer looking through the lens will see the image in its apparent calculated position. A magnifying glass creates this kind of image. In the special case that S1 = ∞, then S2 = f and M = −f / ∞ = 0. This corresponds to a collimated beam being focused to a single spot at the focal point. 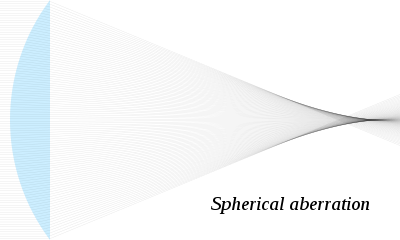 The size of the image in this case is not actually zero, since diffraction effects place a lower limit on the size of the image (see Rayleigh criterion). The formulas above may also be used for negative (diverging) lens by using a negative focal length (f), but for these lenses only virtual images can be formed. For the case of lenses that are not thin, or for more complicated multi-lens optical systems, the same formulas can be used, but S1 and S2 are interpreted differently. If the system is in air or vacuum, S1 and S2 are measured from the front and rear principal planes of the system, respectively. Imaging in media with an index of refraction greater than 1 is more complicated, and is beyond the scope of this article. Lenses do not form perfect images, and there is always some degree of distortion or aberration introduced by the lens which causes the image to be an imperfect replica of the object. Careful design of the lens system for a particular application ensures that the aberration is minimized. There are several different types of aberration which can affect image quality. Spherical aberration occurs because spherical surfaces are not the ideal shape with which to make a lens, but they are by far the simplest shape to which glass can be ground and polished and so are often used. Spherical aberration causes beams parallel to, but distant from, the lens axis to be focused in a slightly different place than beams close to the axis. This manifests itself as a blurring of the image. Lenses in which closer-to-ideal, non-spherical surfaces are used are called aspheric lenses. These were formerly complex to make and often extremely expensive, but advances in technology have greatly reduced the manufacturing cost for such lenses. Spherical aberration can be minimised by careful choice of the curvature of the surfaces for a particular application: for instance, a plano-convex lens which is used to focus a collimated beam produces a sharper focal spot when used with the convex side towards the beam source. Another type of aberration is coma, which derives its name from the comet-like appearance of the aberrated image. Coma occurs when an object off the optical axis of the lens is imaged, where rays pass through the lens at an angle to the axis θ. Rays which pass through the centre of the lens of focal length f are focused at a point with distance f tan θ from the axis. Rays passing through the outer margins of the lens are focused at different points, either further from the axis (positive coma) or closer to the axis (negative coma). In general, a bundle of parallel rays passing through the lens at a fixed distance from the centre of the lens are focused to a ring-shaped image in the focal plane, known as a comatic circle. The sum of all these circles results in a V-shaped or comet-like flare. As with spherical aberration, coma can be minimised (and in some cases eliminated) by choosing the curvature of the two lens surfaces to match the application. Lenses in which both spherical aberration and coma are minimised are called bestform lenses. Chromatic aberration is caused by the dispersion of the lens material—the variation of its refractive index, n, with the wavelength of light. Since, from the formulae above, f is dependent upon n, it follows that different wavelengths of light will be focused to different positions. Chromatic aberration of a lens is seen as fringes of colour around the image. It can be minimised by using an achromatic doublet (or achromat) in which two materials with differing dispersion are bonded together to form a single lens. This reduces the amount of chromatic aberration over a certain range of wavelengths, though it does not produce perfect correction. The use of achromats was an important step in the development of the optical microscope. An apochromat is a lens or lens system which has even better correction of chromatic aberration, combined with improved correction of spherical aberration. Apochromats are much more expensive than achromats. The distance from the second lens to the focal point of the combined lenses is called the back focal length (BFL). As d tends to zero, the value of the BFL tends to the value of f given for thin lenses in contact. which is the ratio of the input beam width to the output beam width. Note the sign convention: a telescope with two convex lenses (f1 > 0, f2 > 0) produces a negative magnification, indicating an inverted image. 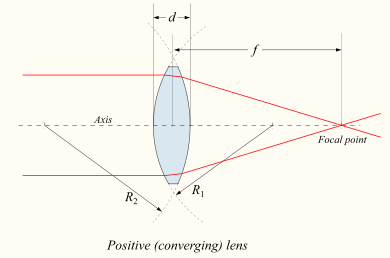 A convex plus a concave lens (f1 > 0 > f2) produces a positive magnification and the image is upright. Lenses are used as prosthetics for the correction of visual impairments such as myopia, hyperopia, presbyopia, and astigmatism. (See corrective lens, contact lens, eyeglasses.) Most lenses used for other purposes have strict axial symmetry; eyeglass lenses are only approximately symmetric. They are usually shaped to fit in a roughly oval, not circular, frame; the optical centers are placed over the eyeballs; their curvature may not be axially symmetric to correct for astigmatism. Sunglasses' lenses are designed to attenuate light; sunglass lenses that also correct visual impairments can be custom made. Other uses are in imaging systems such as monoculars, binoculars, telescopes, microscopes, cameras and projectors. Some of these instruments produce a virtual image when applied to the human eye; others produce a real image which can be captured on photographic film or an optical sensor, or can be viewed on a screen. In these devices lenses are sometimes paired up with curved mirrors to make a catadioptric system where the lenses spherical aberration corrects the opposite aberration in the mirror (such as Schmidt and meniscus correctors). 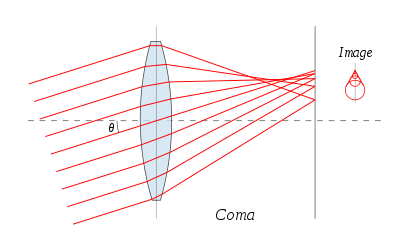 Convex lenses produce an image of an object at infinity at their focus; if the sun is imaged, much of the visible and infrared light incident on the lens is concentrated into the small image. A large lens will create enough intensity to burn a flammable object at the focal point. Since ignition can be achieved even with a poorly made lens, lenses have been used as burning-glasses for at least 2400 years. A modern application is the use of relatively large lenses to concentrate solar energy on relatively small photovoltaic cells, harvesting more energy without the need to use larger, more expensive, cells. Lenses can become scratched and abraded. Abrasion resistant coatings are available to help control this.